Be.as is a module for SAP Business One that allows you to plan and control the entire production process, and a detailed control over their production times. The graphical interface makes this module management simple and easy to use. NEW Be.as 9.2: Import of AutoCAD models with their parts and materials. The new integration center allows direct and detailed import of your projects in a wide variety of formats. With Be.as you can see in real time the performance of their processes: procurement, production orders, customers, deliveries, etc. and make decisions based on the information obtained. Be.as is fully integrated with SAP Business One accounting, accounting therefore all action is an immediate reflection between Be.as and SAP. By Be.as employees charged module production times and you take decisions accordingly, on improving its supply chain, performance, staff skills, etc. Advanced quality control management of shopping and internal control, tools, calibration, testing and deformation measurements, error rules maximum and minimum levels of control, etc. 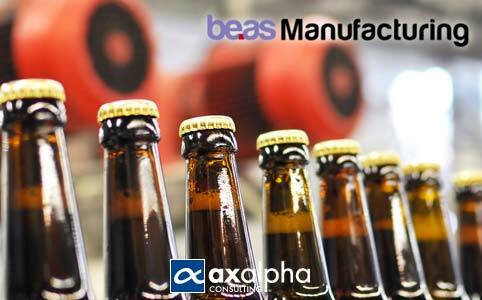 Axalpha Consulting is Official Specialist Partner on Be.as and SAP Business One. Plan and control every detail of the production process, from the power consumption of the machinery until the decline of material (scrap and by-products). Perform simulations and decide how to optimize the process. Be.as is also optimized for SAP HANA syntax, running in parallel with HANA and MSSQL. The module operates with full functionality on this new platform, getting all the advantages of speed and HANA instantaneous transfer of information.